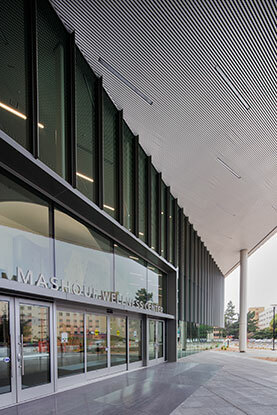 A beacon of environmental sustainability, the Mashouf Wellness Center at San Francisco State University—one of the few LEED Platinum-certified campus recreation buildings in the United States—inspires the lifelong holistic well-being and success of over 30,000 students. 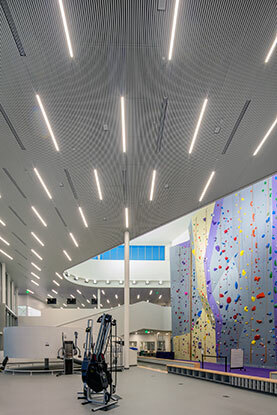 The 118,700 square-foot center serves as a hub for indoor exercise and activity in the frigid, windy environment along Lake Merced Park located south of the Golden Gate Bridge and less than a mile from the Pacific Ocean. The Bay Area’s own WRNS Studio designed the $86.5 million dollar project, which broke ground in 2015. Early on in the design process, the team at WRNS Studio knew that they wanted to create a clean, linear, textured pattern along the various ceilings of the three-story building. 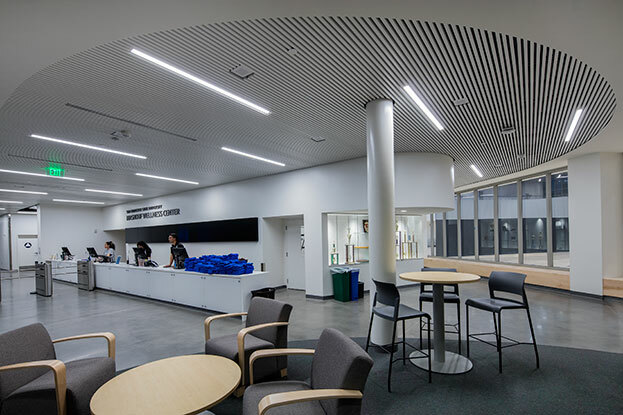 “The ceiling system pulls together the different parts and spaces of the building,” noted Edward Kim, Associate and Project Designer at WRNS Studio. 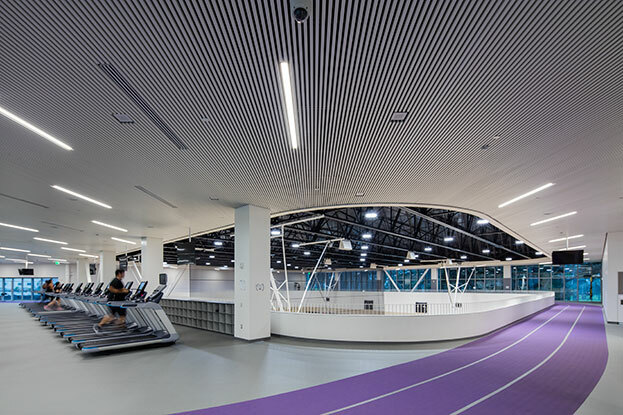 Working alongside Hunter Douglas Architectural reps at The Finish Line, the team ultimately specified around 33,000 square-feet of Continuous Linear Grille ceilings, versatile, lightweight aluminum panels in cotton white. 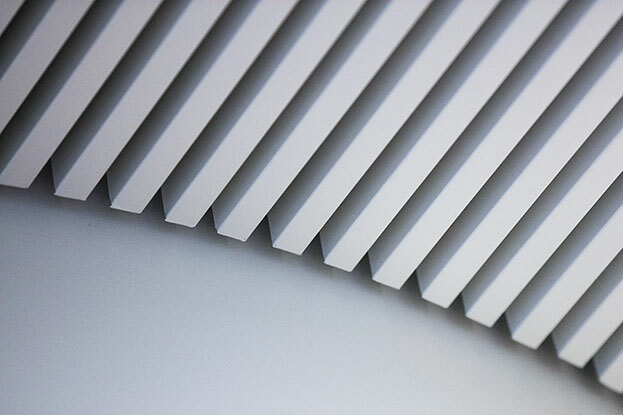 “One of the first things we did in studying our ceiling design and layout was graining everything the same way, even with the building having three distinct geometries,” said Doug Hoffelt, AIA / Associate, Senior Architect at WRNS Studio. 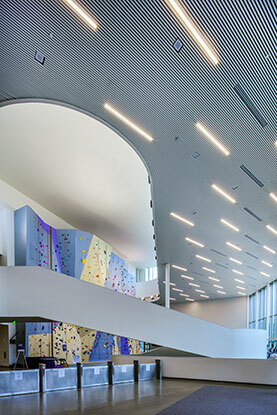 A thirty-foot high exterior ceiling soffit of Continuous Linear Grille draws visitors into the double-height space of the main lobby and climbing wall area, which—when combined with internal ceiling systems and large windows for daylighting—creates a dramatic look. 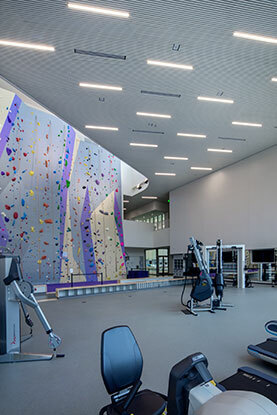 The first floor features a range of spaces including a two-court gym, a multi- activity court, weight lifting areas, a climbing wall, administrative offices, and a natatorium that features an indoor pool, leisure pool, sauna, and spa. 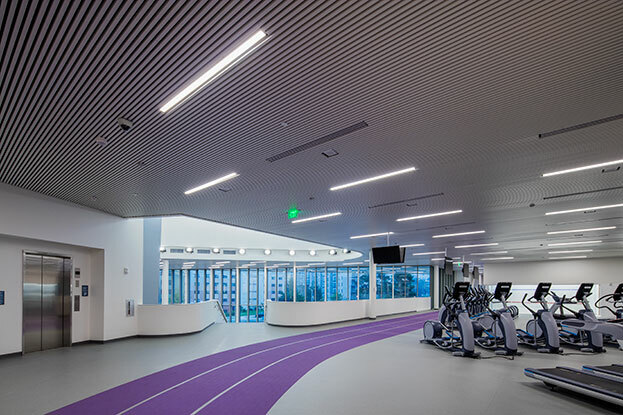 On the second floor, a jogging track stretches around the southern and eastern portions of the building— elevated and open to the gym floors below—with racquetball courts, cardio machines, and other exercise areas for group and individual fitness. 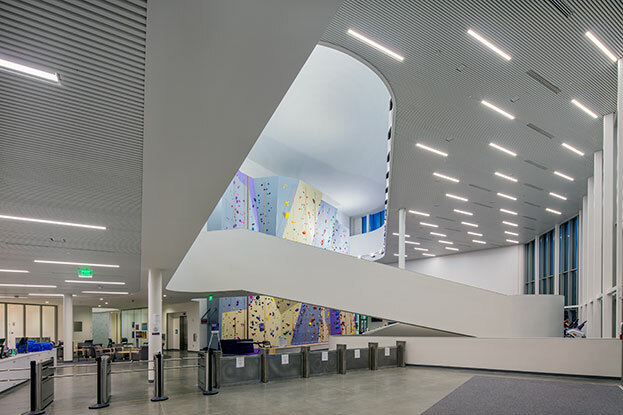 The third floor serves as the landing for the top of the climbing wall. “The second floor is open, so ceiling selection was important. There isn’t anywhere to change the grid, so the ceiling on the entire second floor all points the same direction. There’s a real grain and vanishing point to it, which is my favorite,” added Hoffelt. 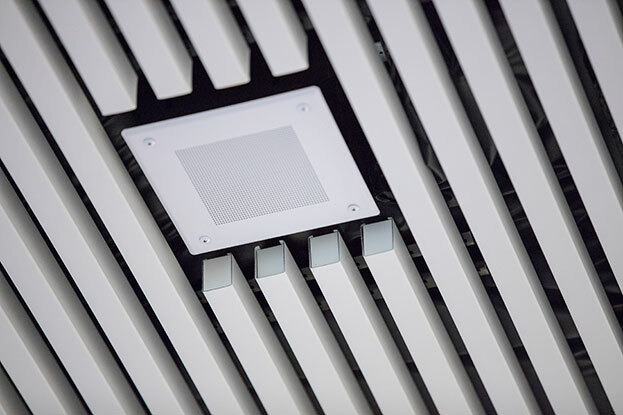 Throughout the space, uniform air ventilation integrated with the ceiling provides consistent temperatures and energy expenditure. 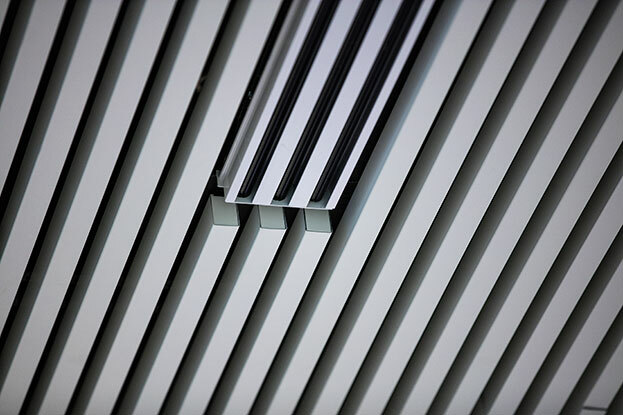 Along the interior perimeters, a small gap for return air between the ceiling system and the wall was intentionally designed to create unique return air flow. This gap also allows for easy plenum access when necessary. Thanks to extensive filtering, cleaning, and recycling, discharge water from the pools and grey water from the building is captured in two tanks. It’s estimated that nearly 334,000 gallons of water will be saved, cleaned, and used as irrigation for the surrounding ecological zones in one year. Other stringent sustainable designs included photovoltaic roof panels that generate nearly 25 percent of the building’s energy. The Mashouf Wellness Center welcomed over 100,000 guests within the first month of operation. 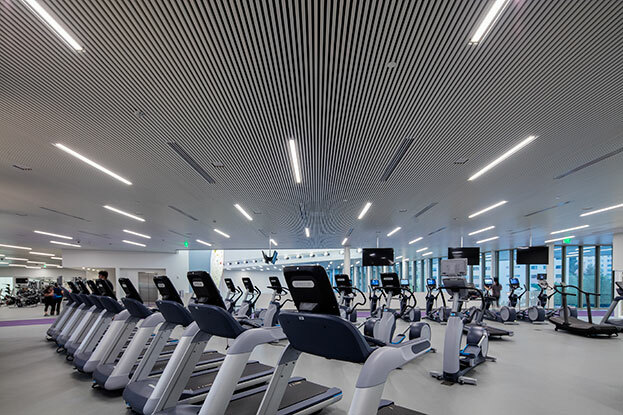 In years to come, the design of the student-driven wellness center positions it to create a sense of community and to serve as a key component in the university’s health and wellness programs.